As a child, I wasn’t very keen on eating meat. It was nothing spiritual, I just didn’t like the taste or the texture. I quickly worked out that our family dog had no such qualms. I used to slip my chunks of meat to him through the crack between the table and the wall. It made for a happy partnership. He got to eat something better than dog food and I managed to clear my plate, thus not incurring the displeasure of my mother. It was only when I joined BP, where the staff restaurant served up 3 course gourmet lunches for the princely sum of 5p, that I started to experiment. As I could pick and choose what I wanted and no-one cared if I left it because I didn’t like it. I found that I enjoyed eating some meat, providing it’s thinly cut and not too fatty. I like meat to have the right form factor. I get very suspicious when the meat chunks are perfect polyhedrons or the edges are perfectly rounded like the chicken you sometimes get in a Chinese take away. 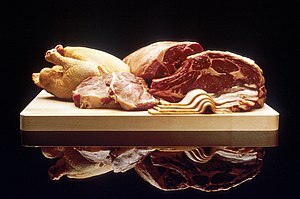 Anyone following the news in the UK will have seen the unfolding scandal of irregular discoveries in the testing of meat and meat based products. Supplier and retailer alike have fallen foul of the DNA tests carried out by food inspectors. Time and again, where one would expect to find beef, the inspectors have found horse. In one particular case, they found pork in supposedly halal meat supplied to a prison. The problem seems to have stretched throughout the supply chain and has probably been going on for some time. All this makes my toes curl. It’s not so much about eating horse. What else have they been putting into these products? It’s bad enough that sometimes I start looking around for a hungry dog when I think about eating meat. I sincerely hope that the perpetrators are found and harshly punished. Misrepresenting foodstuffs is a low act. If I had my way, they would be sent to prison where they would be fed on a diet of mystery pies filled with all manner of dead flesh. Each day, they would be told they were eating beef. As I was growing up, there was a relative paucity of fast food outlets in our local town. We had not one but two fish and chip shops and a Kentucky Fried Chicken. There was also a Wimpy Bar, but at that time Wimpy was more about table service than it was about grabbing a bite to eat on the move. It was also comparatively expensive to anyone trying to live within a pocket-money budget. I remember when McDonald’s came to our town it was a very big deal. The fast food giant was almost completely unknown unless you had been to the States. Air travel was much less common back then, so for most of us, we learned about McDonald’s from a story in the local paper. The brand was presented in a very positive light, seen as a much-needed employer and a sign of progress. Maybe it’s nostalgia, but I seem to remember that the food back then was pretty good too and certainly very keenly priced. On a Saturday, my £1 pocket money would be burning a hole in my pocket and I quite often treated myself to a bus ride into town and a burger. I could even afford chips and a drink if I walked to town and only took the bus back. Not long afterwards in 1980, Marks and Spencer’s started to sell sandwiches and it’s fair to say that they set the bar very high for take away sandwiches. Many other supermarkets followed suit, but their sandwiches tended to be pale imitations of the legendary Marks and Spencer’s sandwich. My favourite has always been the chicken salad sandwich – absolutely delicious. Ever since those times, there has been an absolute explosion in the variety of fast food establishments adorning our high streets. I would struggle to walk 50 yards in our local town without coming to a coffee shop. We have two Gregg’s Bakers, two Subways, a Burger King, a Cornish pasty place, umpteen pizza chains and several cafes. Ironically, the fish and chip shops are gone as is the McDonald’s. If my income was still £1 per week, I would be well catered for in the high street of today. There are a huge number of shops who set the unit price of all of their stock at that magic figure. I rarely go in those shops but when I do, I am amazed at the range and sheer variety on offer and it baffles me as to how it is economical to manufacture all those things in some faraway land, float them over, put them on a truck to get them to the shop and then sell them but it is obviously a thriving sector. People must buy a lot of phones too. Every single mobile phone network has a shop in town selling shiny new gadgets. Not only that, but there are a couple of independents too and umpteen market stalls toting accessories to wrap your shiny new purchase. It’s hard to believe that 20 years ago, this market didn’t exist and today, 1.5 billion phones are shipped annually. In fact, if you took away the food & drink outlets, the pound shops, the mobile phone retailers, the charity shops, the pawn shops and the clothes shops, you’d be left with the bookies. Governments all over the world are facing up to the economic realities of balancing the books. After a brief bout of teenage profligacy, I found myself in much the same fiscal boat. The obvious solution in my case was to get a part-time job. This was effective on two levels; firstly, whilst I was working, I was kept out of mischief and unable to spend money and secondly, I was also earning money at the same time. I worked in a large pub restaurant just outside my home town as a barman. I thoroughly enjoyed it. I liked the social contact with the regular customers and revelled in the camaraderie of my fellow bar staff. To my surprise, I seemed to be good at it as well. For a while everyone was happy. My bank manager was happy that the overdraft was inching down, the one-legged owner of the bar was happy with my performance and I was happy doing the job. One Summer’s evening, the one-legged man walked over to the bar and told us that several of the waitresses had phoned in sick. Not only that, but we were fully booked that evening. There was only one thing for it. One of the bar staff would have to take a shift on the waiting team. We drew straws. I might be good at working behind a bar, but I’m useless at drawing straws, so a short while later, the Maitre D’ lectured me on what to do and what not to do. I tried to explain to him that I had the manual dexterity of an elephant wearing boxing gloves but he would have none of it. My first table seemed to go OK, but it was only two covers. Lulled into a false sense of security about my skills as a waiter, the Maitre D’ assigned me to a larger table – four covers this time. I took their orders and when the very attractive lady in the pretty white dress ordered the pea soup, my heart sank. I’d already tried a dummy run in the kitchen with a tray full of bowls filled with water – it didn’t end well. As the chef called service, I took my place at the serving hatch. Ever so carefully, I balanced the four starters on the tray. Making sure the tray was rock steady, I set off towards the table. I moved slowly, planning my route carefully so that I avoided any chance of a collision. Arriving at the table, I lifted the first starter and placed it on the table. The tray lurched in an alarming fashion and the soup came very close to the rim of the bowl. I adjusted the tray, but unfortunately over compensated. Almost in slow motion, the bowl slid down the tray and over the small lip at the edge. Like a heat seeking missile, the bowl and its contents tumbled end over end before landing squarely in the attractive lady’s lap. 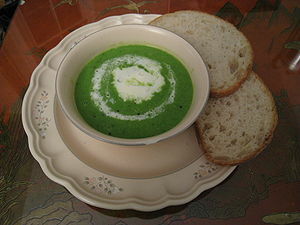 Her pretty white dress was covered in bright, green soup. With surprising swiftness, the one-legged man appeared and ushered me away from the table whilst the Maitre D’ appeared from nowhere and apologised profusely to the customers. Before too long, I was safely ensconced behind the bar once more. The one-legged man admonished me and told me that was the last time I would be a waiter. Silently – I agreed with him. I caught sight of the woman leaving the restaurant later that night with her soup-stained dress. As she walked out, she smiled and blew me a kiss. My wife regularly asks me a question such as what do you fancy for dinner tomorrow night, which seems a bit like asking me where I want to go on holiday the year after next. I simply don’t know. I can tell you what I feel like now or whether I liked what I just ate but asking me what’s going to tickle my culinary fancy tomorrow is a bit of a stretch. I can’t imagine there were too many such conversations in the Neanderthal household. Back in those days, what you ate came down to what you could grow or catch. If you fancied something meaty it came down to whether you could run faster than this evening’s dinner. Once the nasty business of killing was out of the way, you had to peel your meal – removing any fur or feathers. Before fire was discovered, having rare meat was not a choice, it was a necessity. I don’t think I’d have lived too long unless a met a particularly feisty cave girl. With bartering came a lot more choice. Instead of doing everything yourself, you had the option of sharpening your neighbour’s axe in exchange for a chicken or hiring out your feisty cave girl for something more exotic in return. No-one really moved around that much, so communities were still restricted to what lay within easy reach. With more mobility came more choice still. Knowing that rarity breeds value, smart people with orchards went to where there were no orchards and exchanged their goods. As transportation technology evolved, foodstuffs could be moved further and further. Unfortunately, most food has a shelf life and perishability determined how far they could travel. Salt became the preservative of choice or food was cured or pickled in some way. People eventually worked out that keeping foods cold helped to keep them for longer. 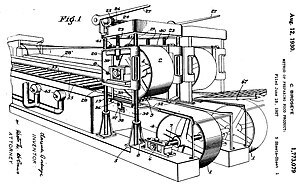 In the beginning, there were no artificial cryogenics available, so large blocks of slowly melting ice in cool rooms had to suffice. Once the humming white box in the corner had been developed, there was no stopping us. Everything was frozen from vegetables to meat and a whole new selection of sweets became available for the first time. Legend has it a certain Captain Birdseye realised on a polar fishing expedition that food frozen quickly tasted so much better than the stuff that was left in the icebox to cool down on its own. Of course, now that the other side of the planet can be reached in a mere 24 hours, pretty much any delicacy from anywhere in the world is available in a choice of high street supermarkets all year round. Ecologically, this is a disaster. There is every chance that if you choose the right (or wrong depending on your point of view) choice, the carbon footprint of your evening meal could be several thousand tonnes. All this explains why our fridge and freezer are rammed full of a multiplicity of ingredients – hence my wife’s insistent question!